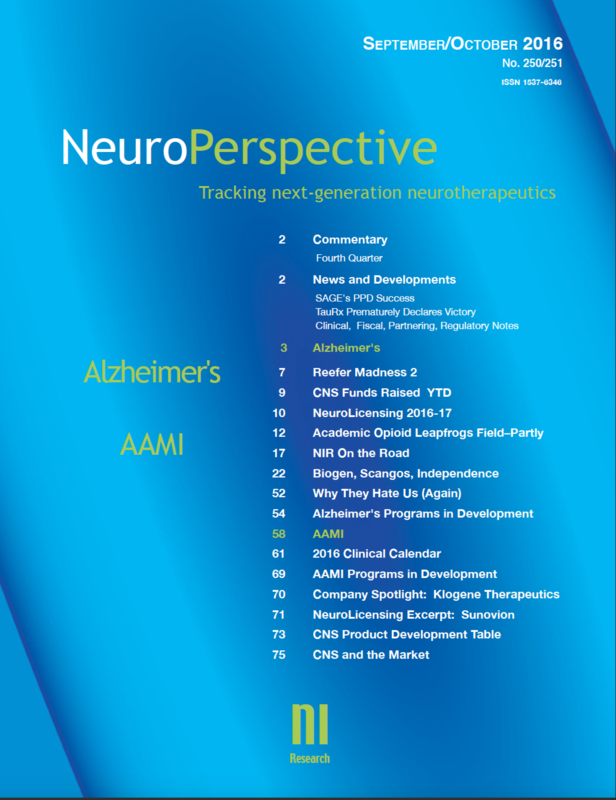 The March/April 2019 issue of NeuroPerspective has been released, offering detailed reviews of two therapeutic areas, as well as coverage and commentary regarding significant developments in the CNS therapeutics space. The first therapeutic sector review covers Schizophrenia, the most devastating of all the psychiatric disorders, one which comprises the awkward melding of multiple schizophreniform phenotypes with very divergent symptom patterns. Affecting about 1% of the population, schizophrenia’s genetic vulnerabilities are complex and contribute to schizophrenia’s etiological confluence of genetic flaws, prenatal/perinatal environmental factors, and later anomalies in the formation and ‘editing’ of synaptic networks. At its root, schizophrenia most likely arises from neurodevelopmental failure exacerbated by the degenerative impact of aberrant adolescent synaptic ‘pruning,’ perhaps reflecting aberrant neuroinflammatory/immune system activity. Network deficits account for the neural dyscontrol that sets the stage for hallucinations/delusions, and for the impoverishment of cognitive capabilities and motivation. While there is promising work on neuroinflammation currently ongoing, with a predominant focus on neurodegeneration (e.g. Alector, Annexon, Denali), the potential application of that work to schizophrenia lags far behind. Symptomatic treatments for schizophrenia are still the currency of the clinical practice and clinical development realms: Current therapeutics are almost solely aimed at the so-called positive symptoms of schizophrenia, there has been no real success developing treatments for the cognitive and negative symptoms that take such a functional toll, even when the more florid symptoms of schizophrenia are relatively controlled. Some of the companies whose programs are discussed in the review include: Biogen,Intra-Cellular Therapies, Karuna Pharmaceuticals, Cerevel, Allergan, Boehringer Ingelheim, Sage Therapeutics, Lundbeck, Takeda, Acadia, Promentis, Newron, Syndesi, SyneuRx, and Sunovion. The second therapeutic sector review covers Stroke, an area which became anathema to the pharma industry after a series of clinical failures 15-20 years ago. With almost 800,000 stroke cases annually in the US alone, this neglect (which had left stroke R&D primarily the province of endovascular device companies) has been untenable in the long run. Biogen is the first of the major pharma companies to make a return to stroke, via partnerships with Remedy and TMS. There is work on extending the window for thrombolytic interventions (ActiCor, Biogen), solving the seemingly intractable puzzle of neuroprotection (NoNO, AdMIRx, Avilex, ZZ Biotech), and a growing emphasis on repair/regeneration, particularly by the several cell therapy companies engaged in that work (Athersys, SanBio, NeuralStem, ReNeuron). Programs from BioAxone and Idorsia address hemorrhagic stroke. Other companies and academic centers whose programs are discussed in this review include: UCLA, ArunA, NeurOp). The March/April issue also includes discussion of recent clinical findings from companies addressing depression (JNJ/Janssen, Sage Therapeutics,Axsome, Blackthorn Therapeutics); high-innovation partnerships for Voyager with AbbVie and with Neurocrine, Biogen with C4T and Skyhawk, and possible salvation for the PTSD program from Bionomics. The Company Spotlight Review covers SyneuRx, which is in PhII/III trials using sodium benzoate/NaBen for schizophrenia and dementia. NI Research is the leading publisher of independent research on the neurotherapeutics industry, and has developed an unmatched information base regarding both publicly and privately held CNS companies. NeuroPerspective is the authoritative, independent, monthly review of the neurotherapeutics area, providing critical analyses of therapeutics-in-development. A one-year (1-5 user) subscription to NeuroPerspective is $2800. Special startup, nonprofit, and academic pricing is available. The March/April issue of NeuroPerspective is available as a single-issue purchase for $600.